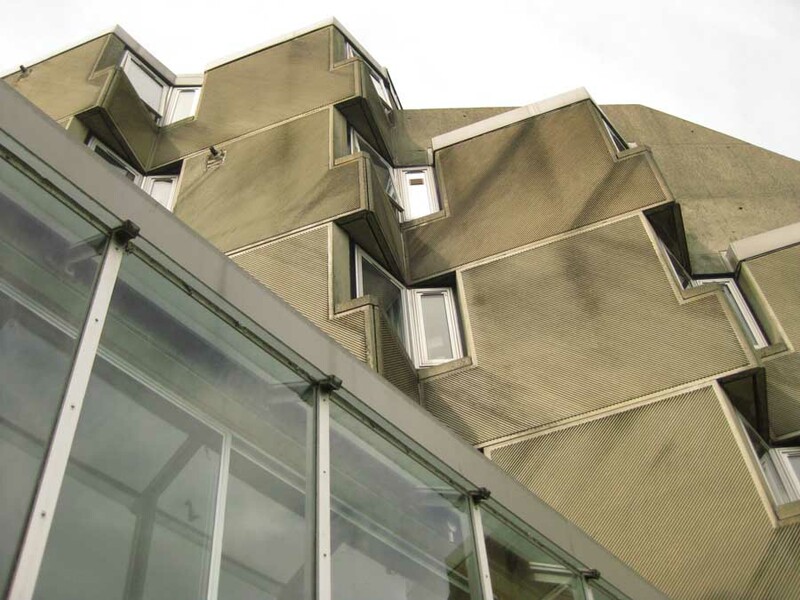 “To celebrate the 50th anniversary of the project it would be wonderful to complete Jim’s masterplan perhaps with a different architect designing each of the 5 ‘wings’ “. 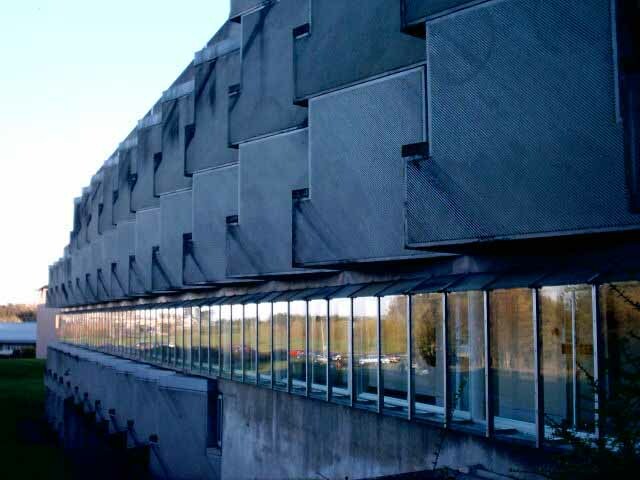 The black book (which has a project dated 1964 between Jim’s Cambridge and Oxford designs) shows and explains that the concept was to build the project in four phases A1 (which was built) A2 a mirror of A1 and then B1 and B2″ as a mirror of A1 + A2. 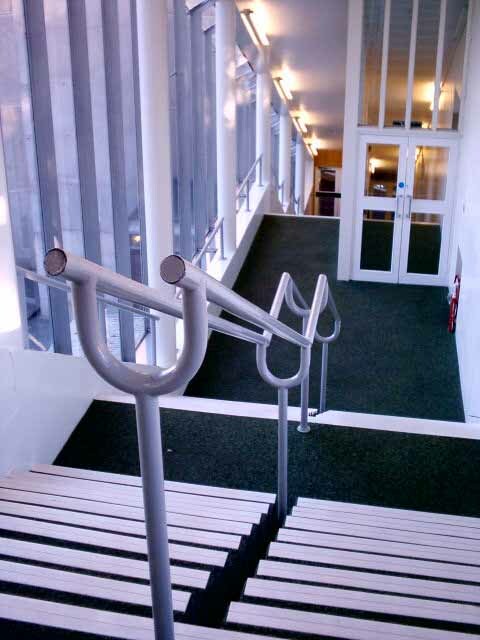 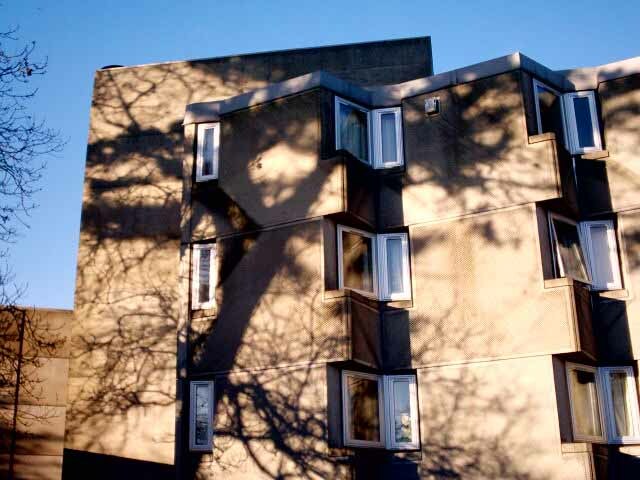 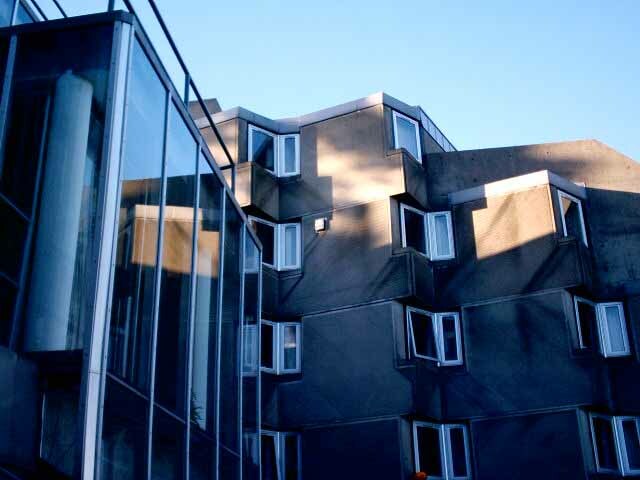 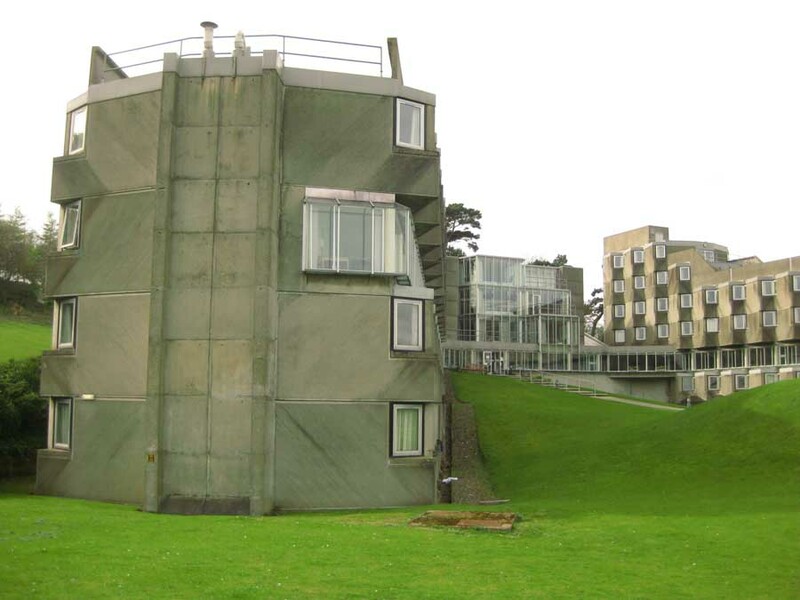 Where does this building sit chronologically relative to the key works by James Stirling? 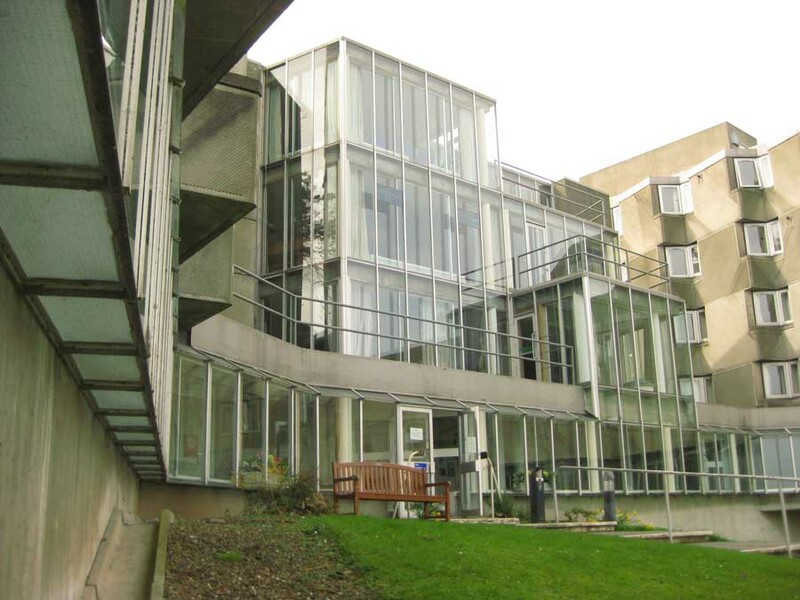 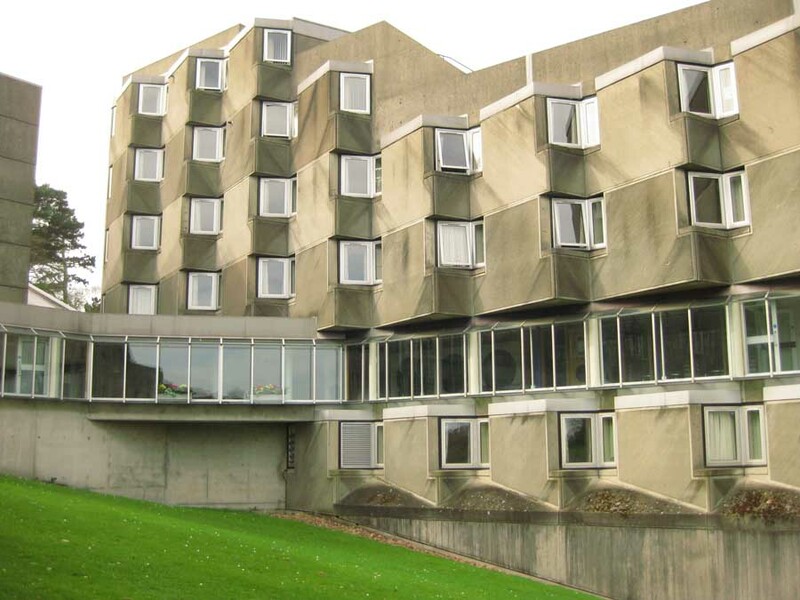 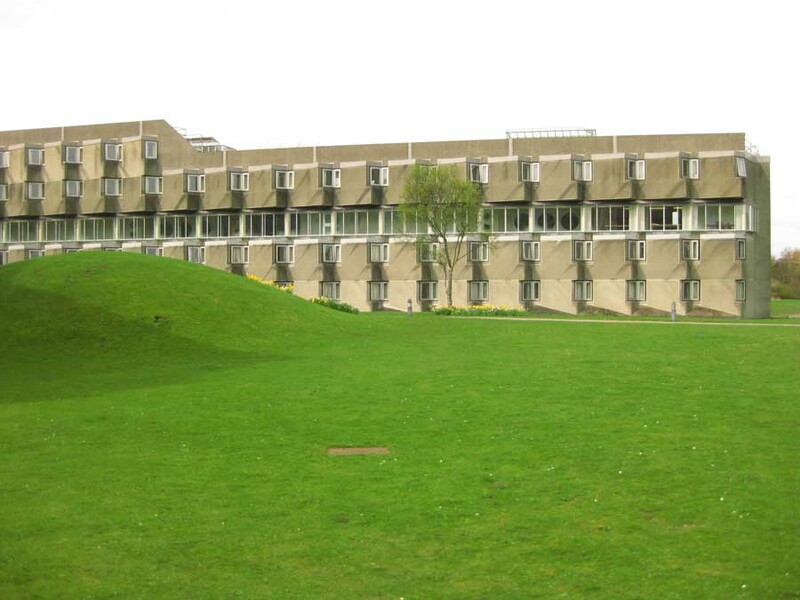 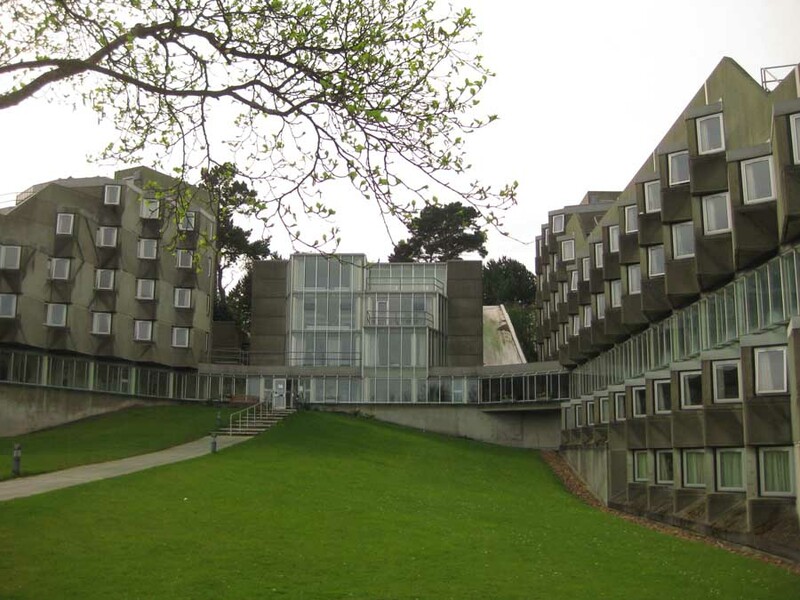 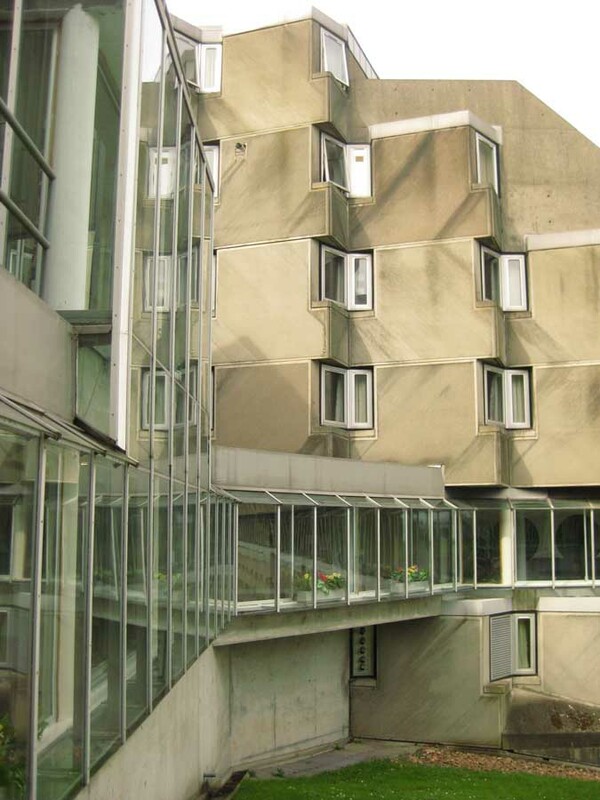 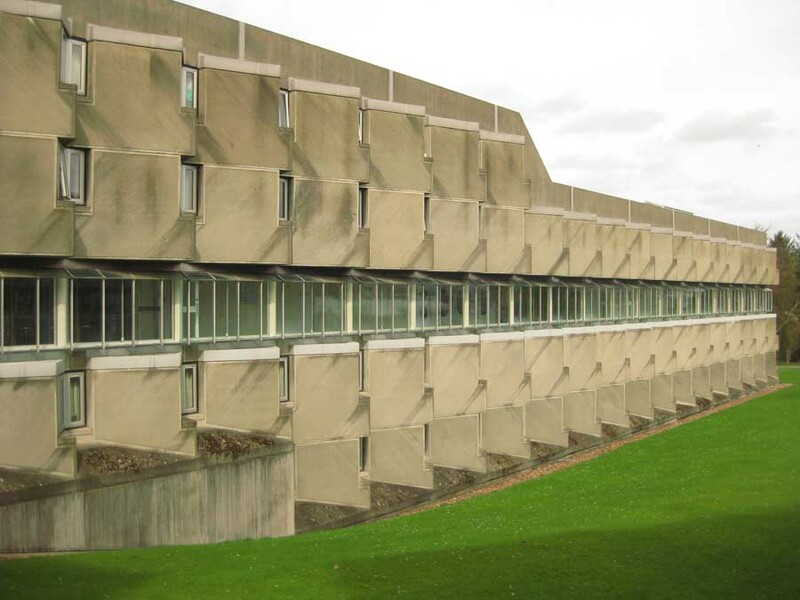 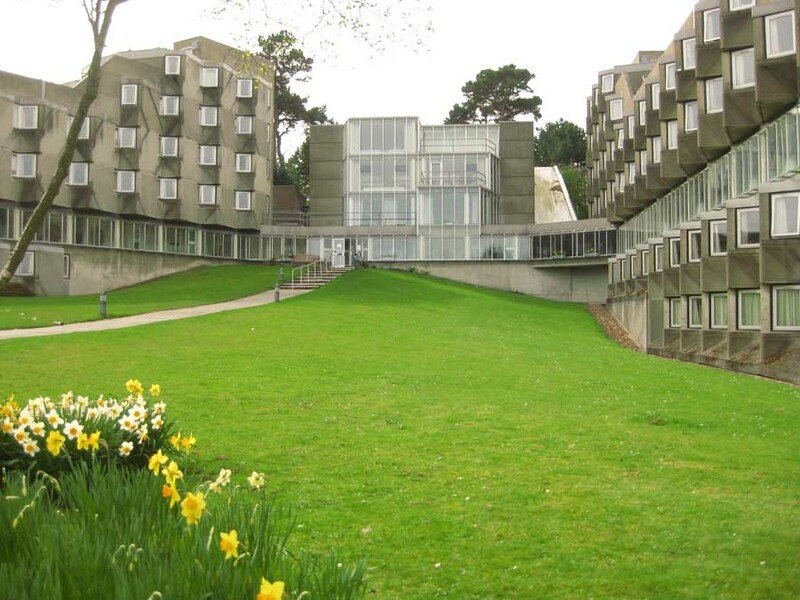 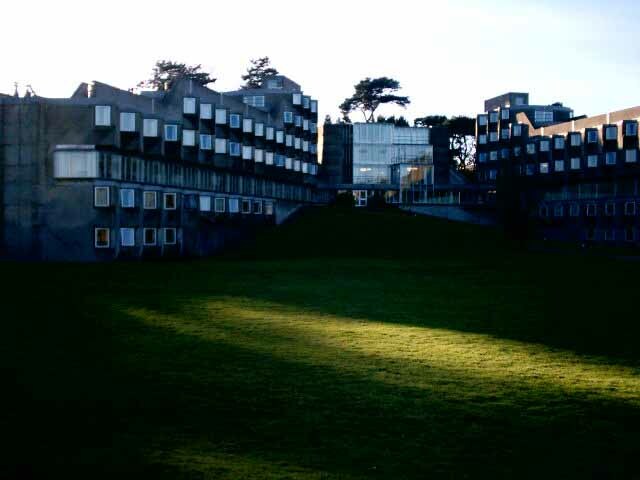 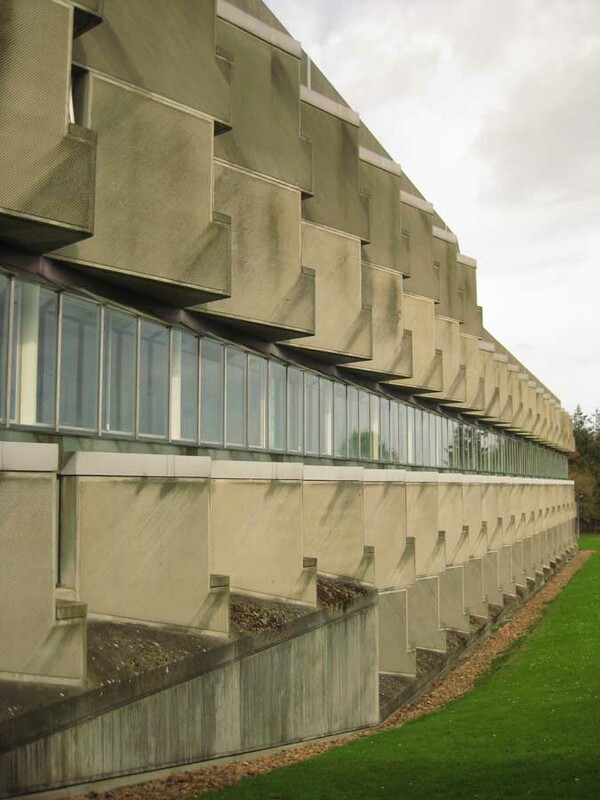 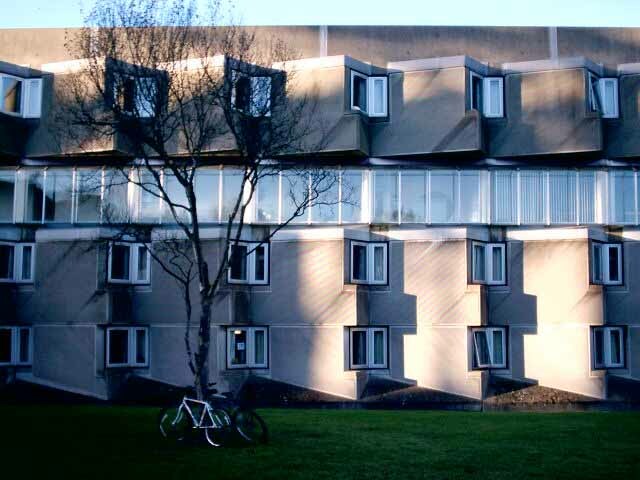 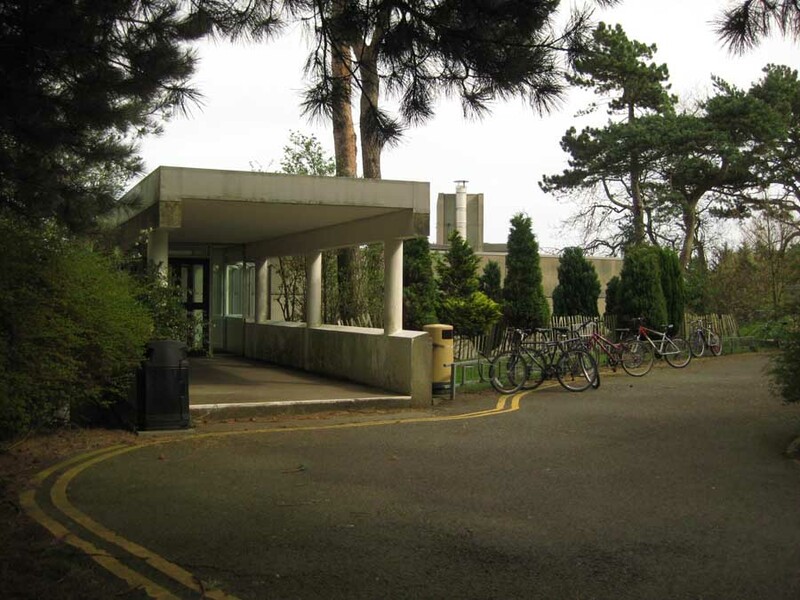 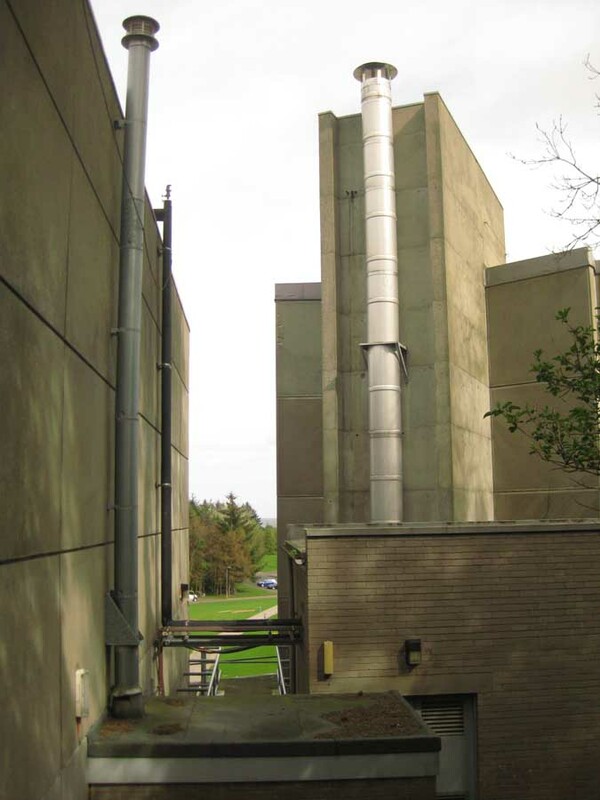 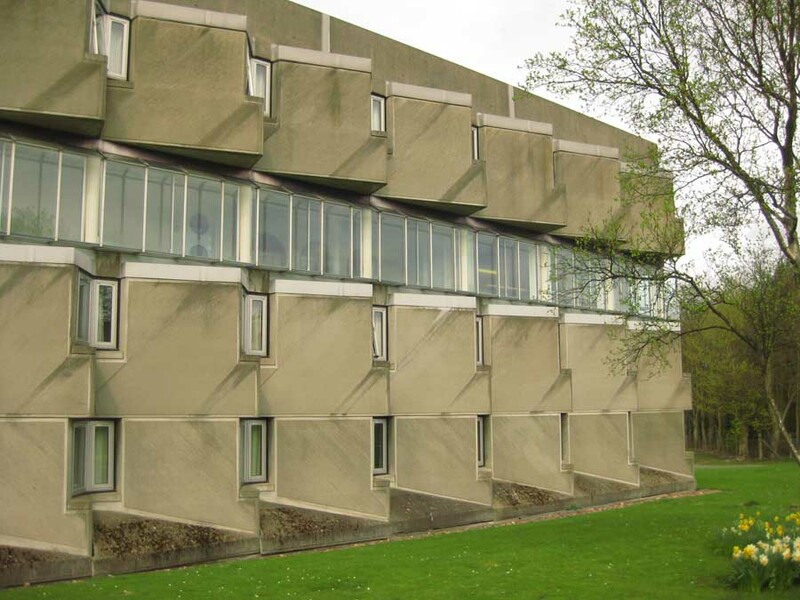 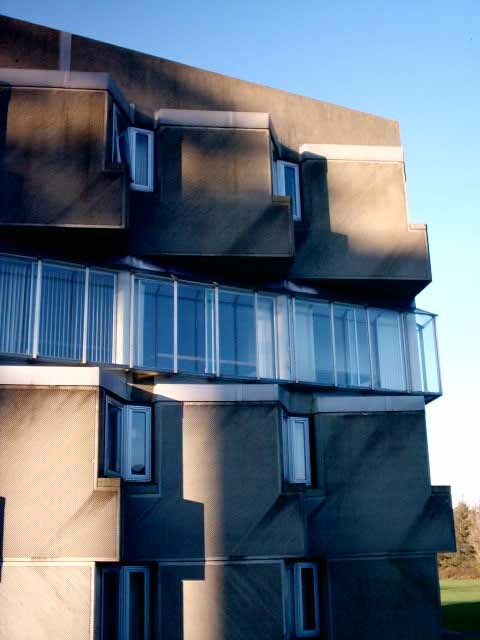 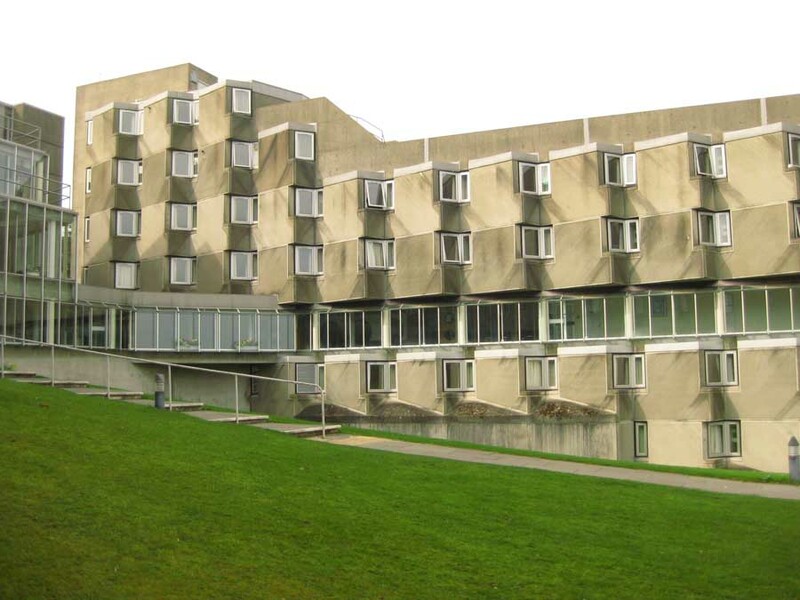 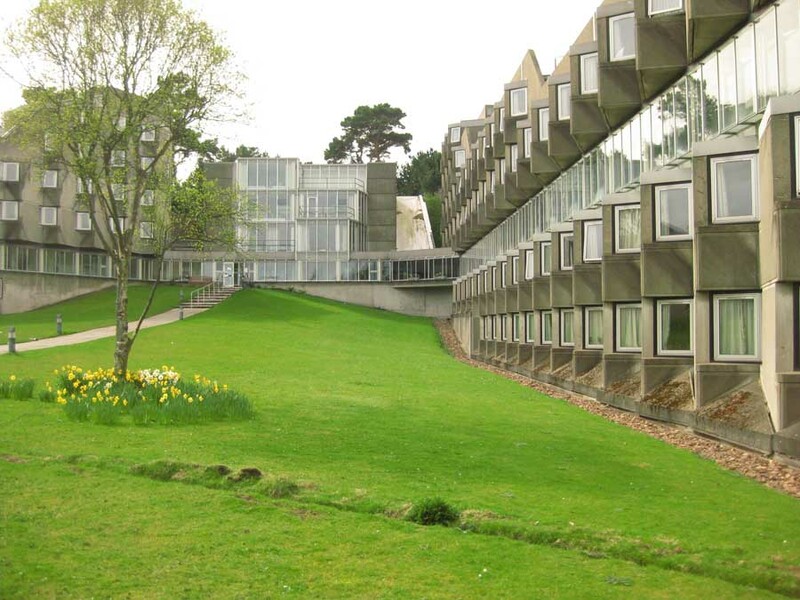 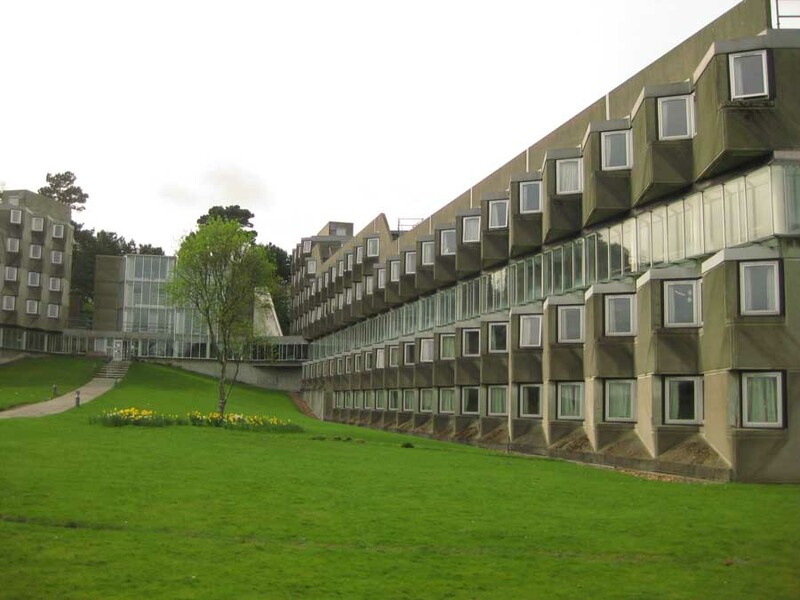 Completed in 1967 it followed the Engineering Building, Leicester University, England (1959-63 – Stirling and Gowan) but preceded the Faculty of History, University of Cambridge, England (1968). 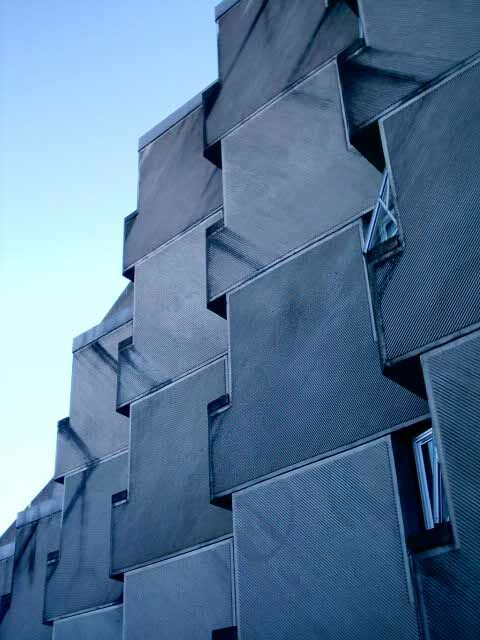 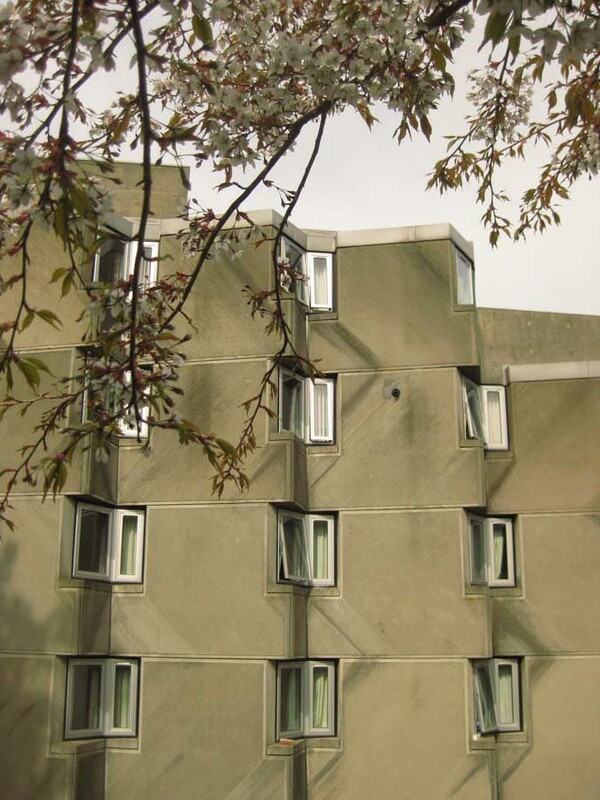 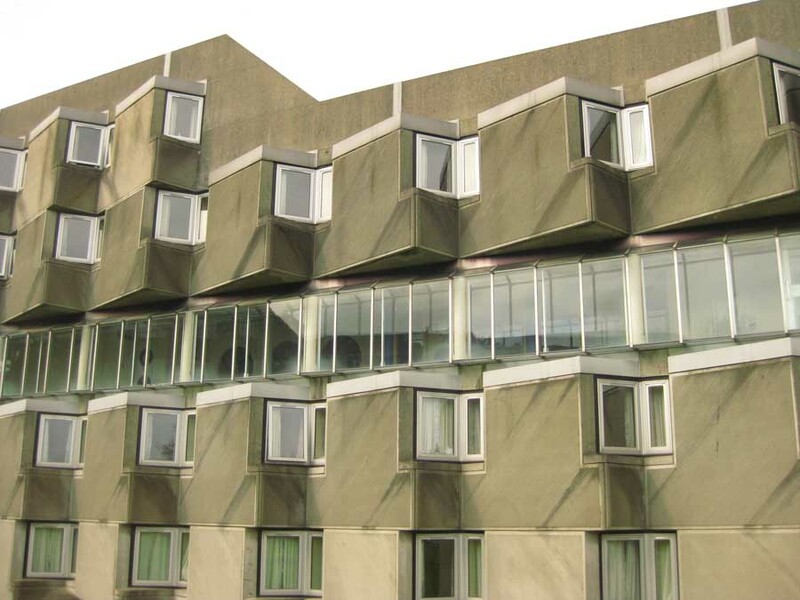 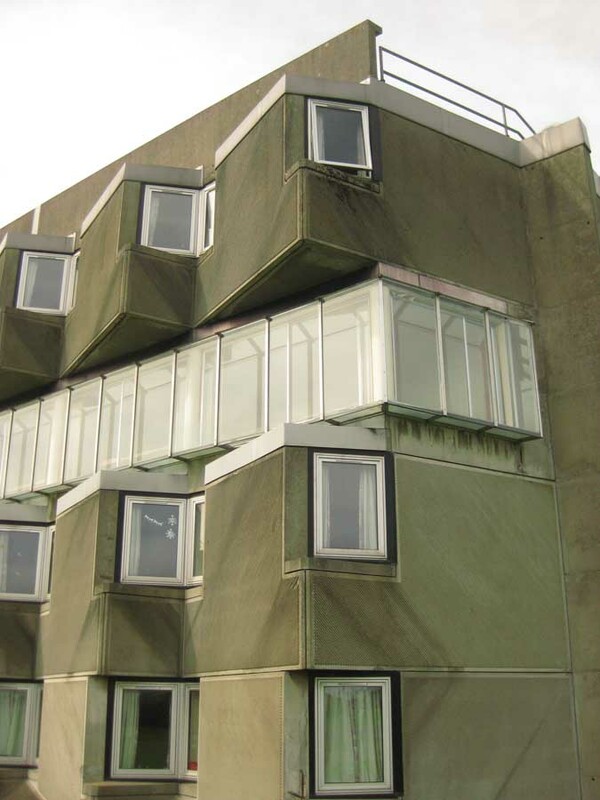 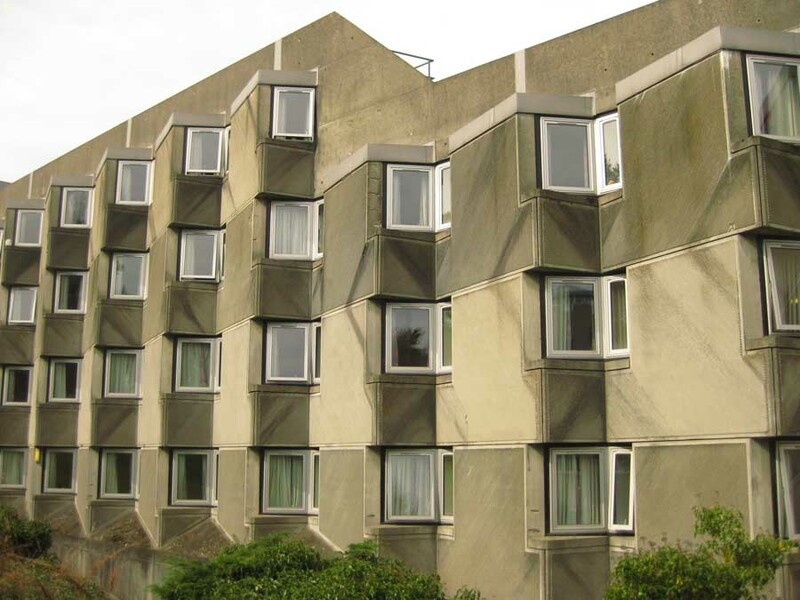 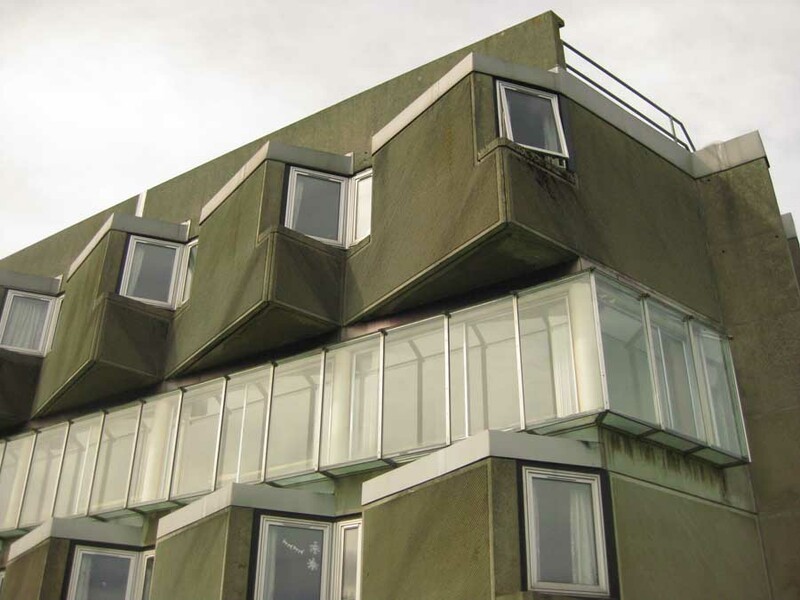 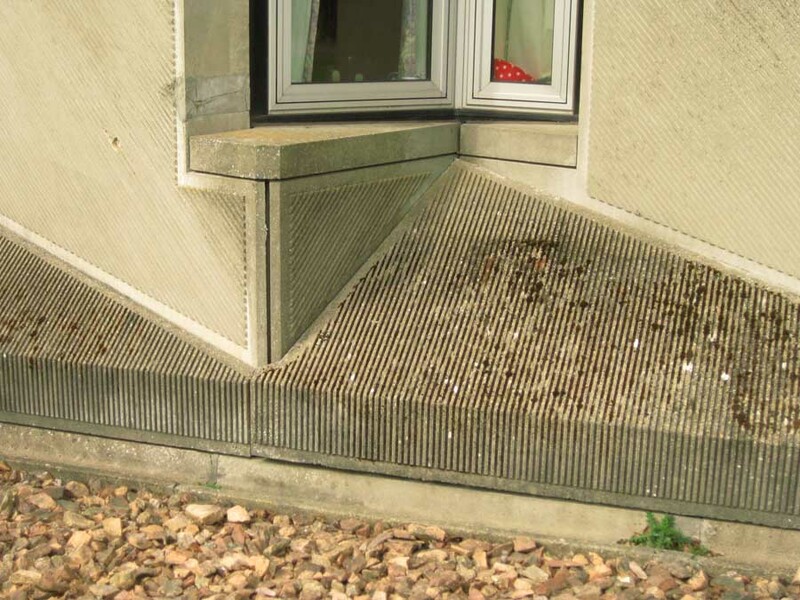 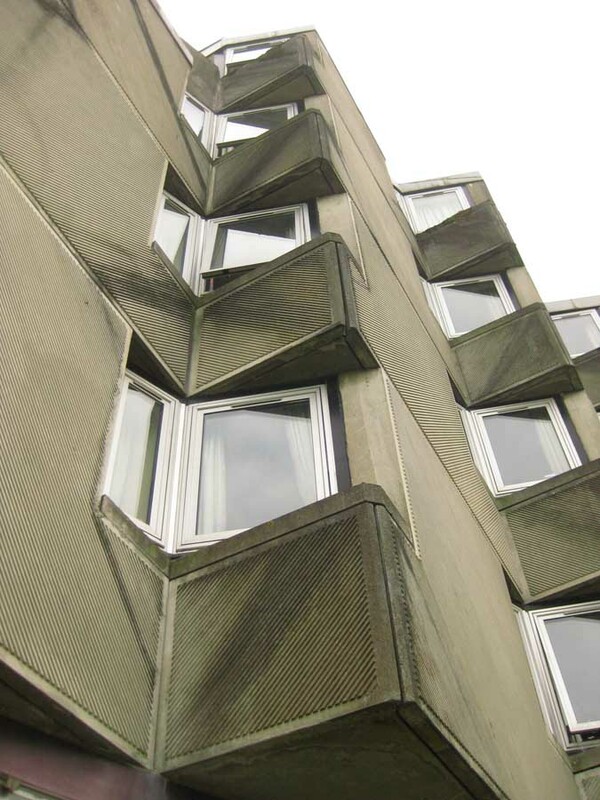 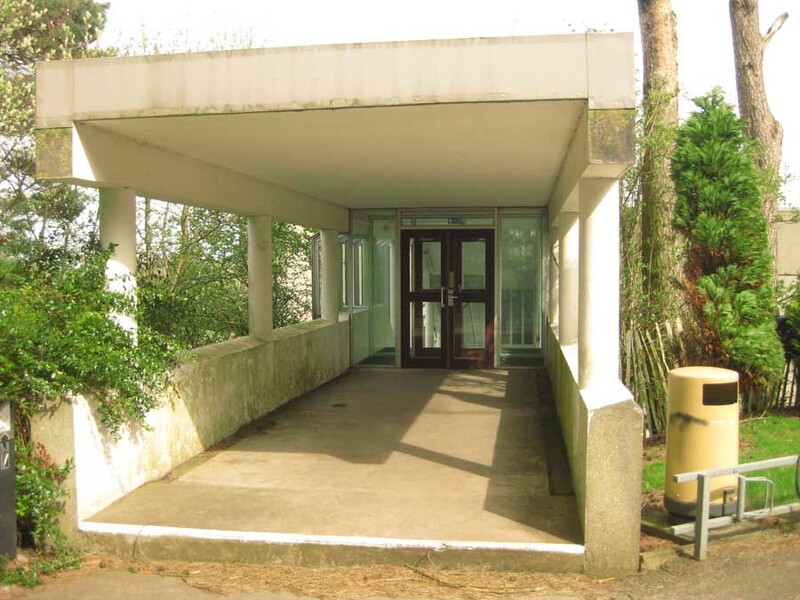 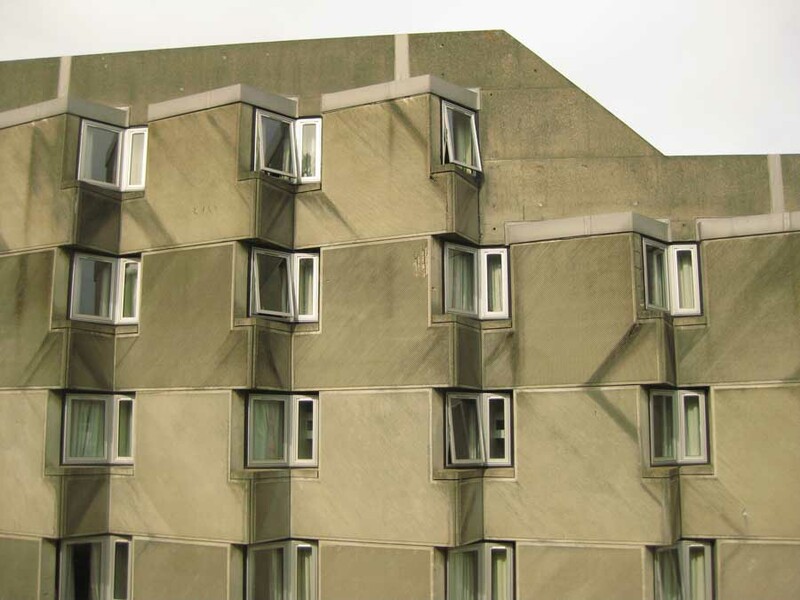 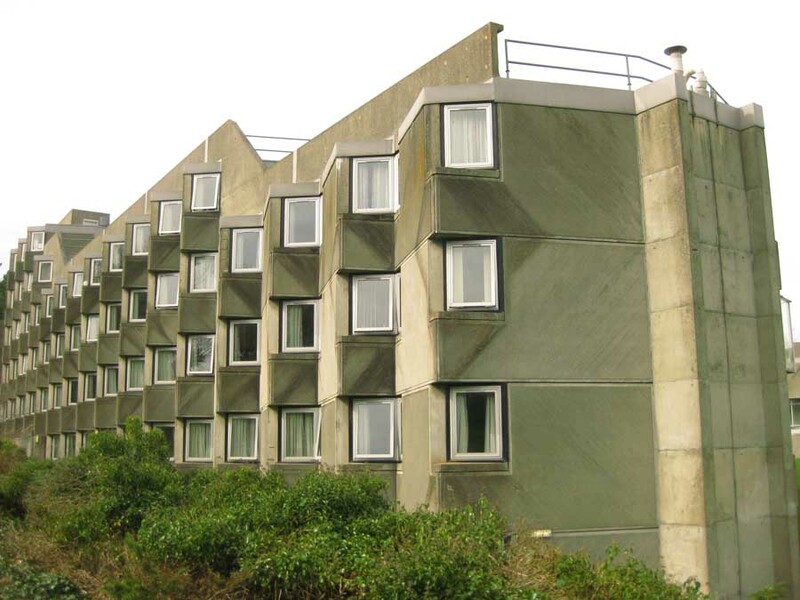 Unlike the later Olivetti Training Centre, Haslemere, Surrey, England (1969-72) the material of Andrew Melville Hall is resolutely of the sixties, patterned concrete – in fact the texture of the facades has a strong effect on the overall feel of the building. 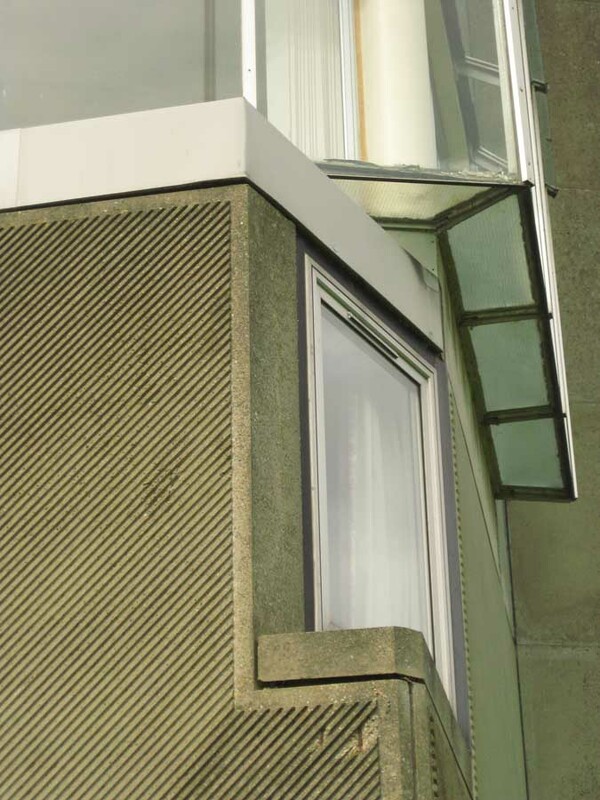 The angled pattern works at the micro scale and resonates with the angled articulation of window bays (and various lesser elements). 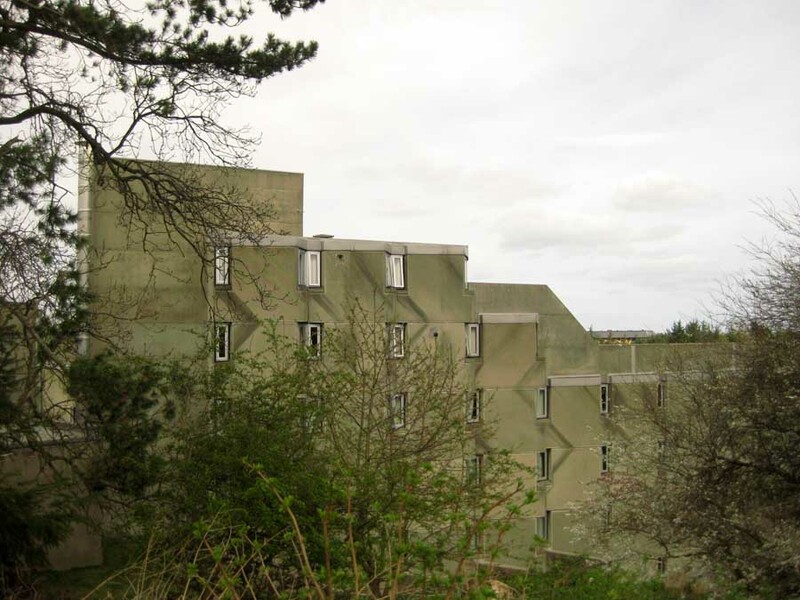 The building is formed by two wings angled in plan that face roughly east out to the North Sea. 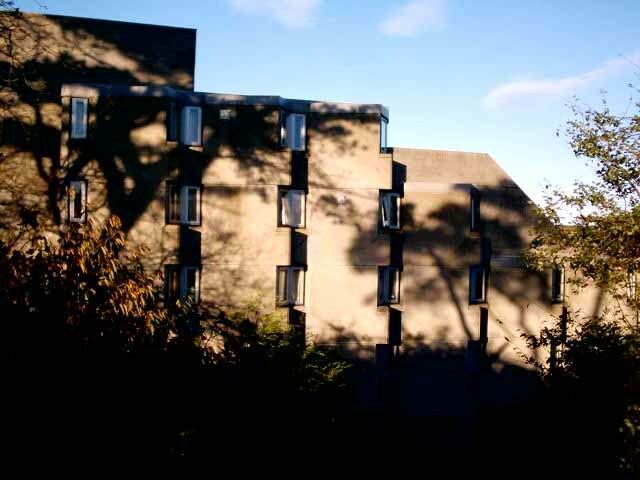 Andrew Melville Hall is located on the north side of the town and faces onto the famous golf course. 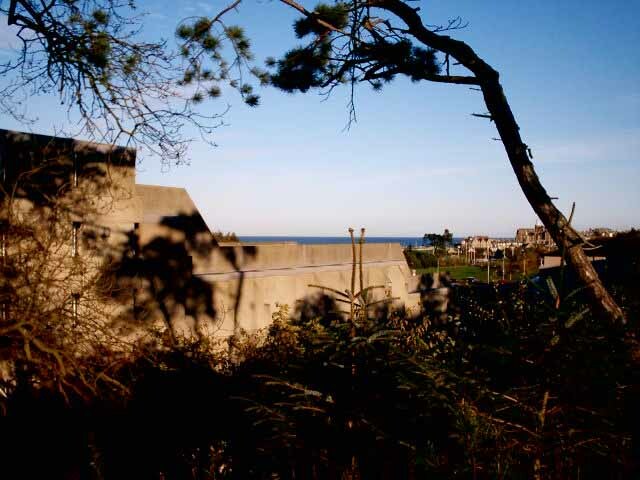 The land slopes up to the west. 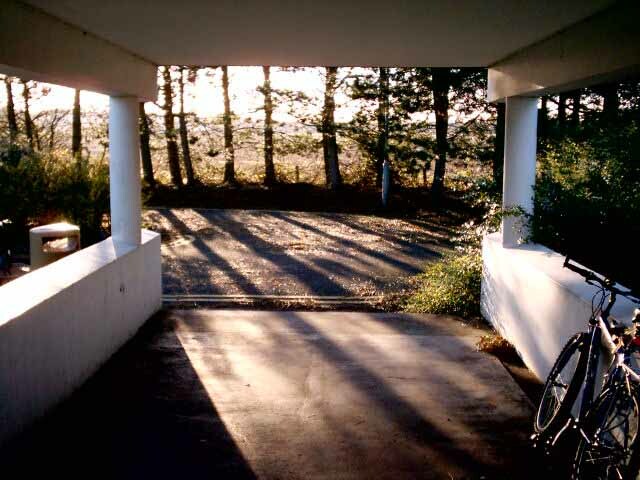 Entry is either up the path between the wings (from the east) or by car at the top level (from the west). 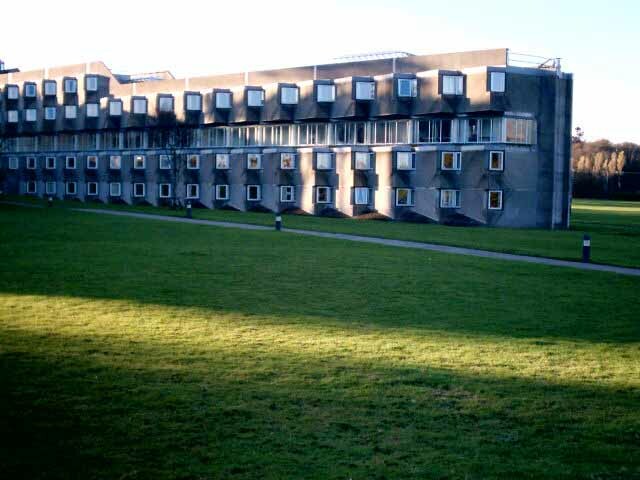 Two wings set at an acute angle with student dormitories stepped down section towards the tips from a pivotal core. 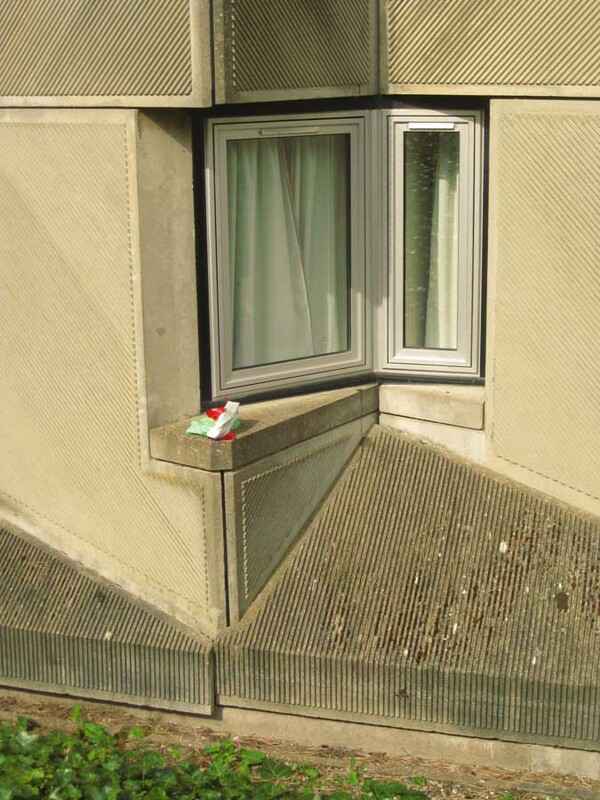 Description further down page. 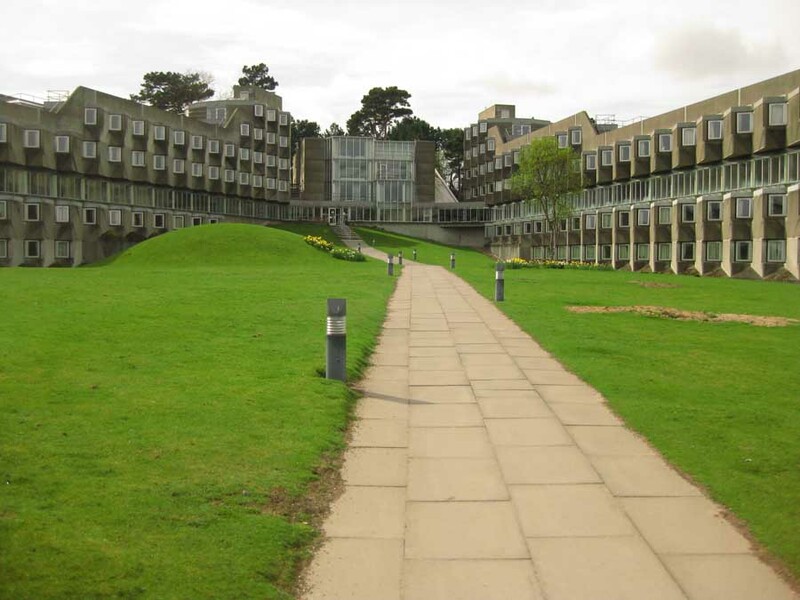 The halls are set at the western edge of the St Andrews University campus at the north of the town, facing out to the famous golf courses. 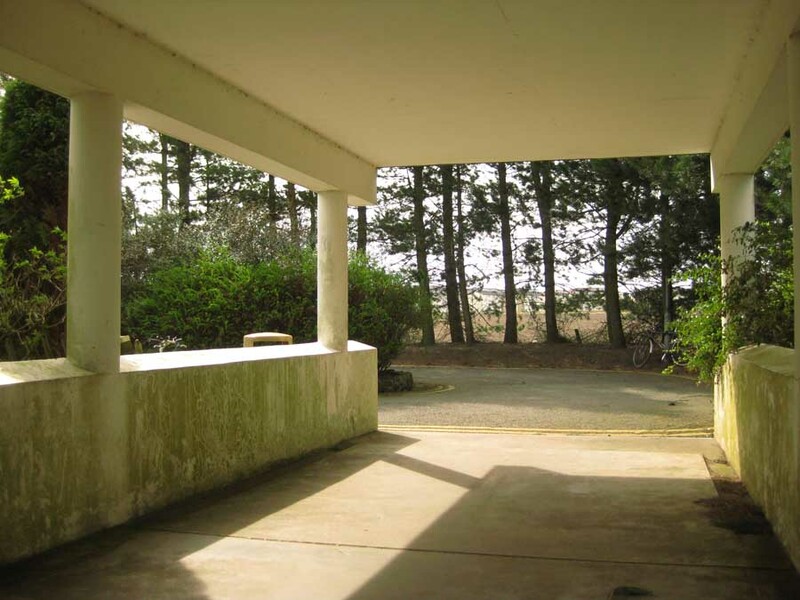 The initial impression is of strong programme and acres of concrete. 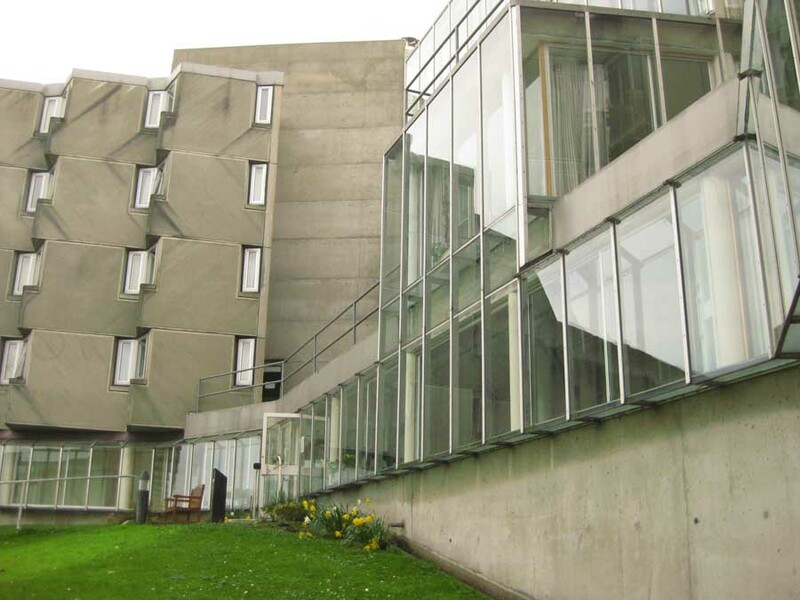 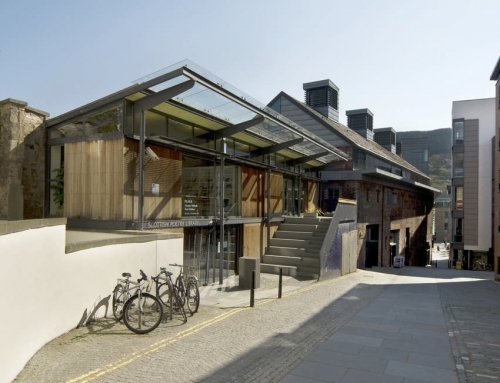 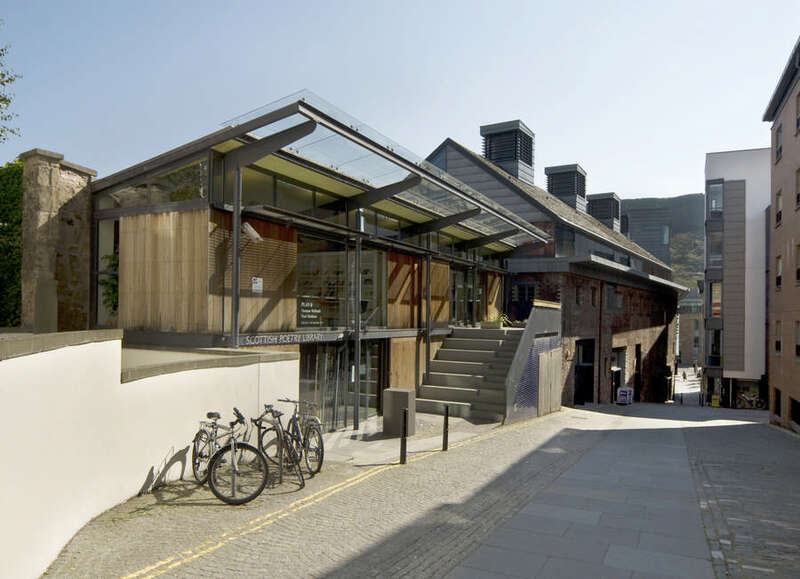 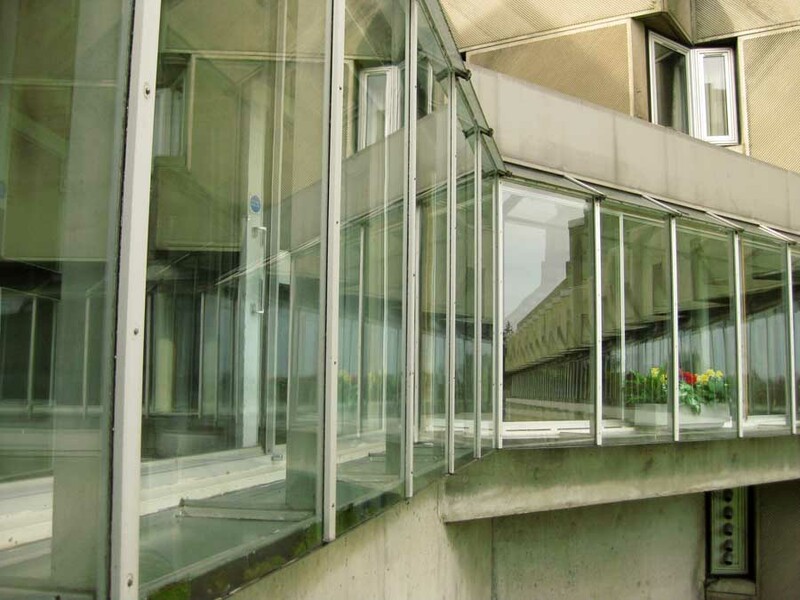 The buildings have a serrated plan – the angled windows provide strong rhythm to the facades. 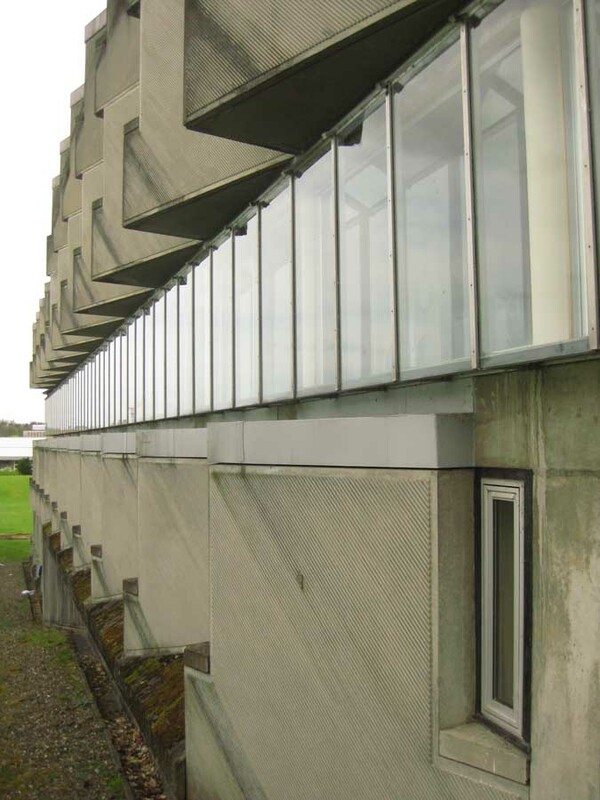 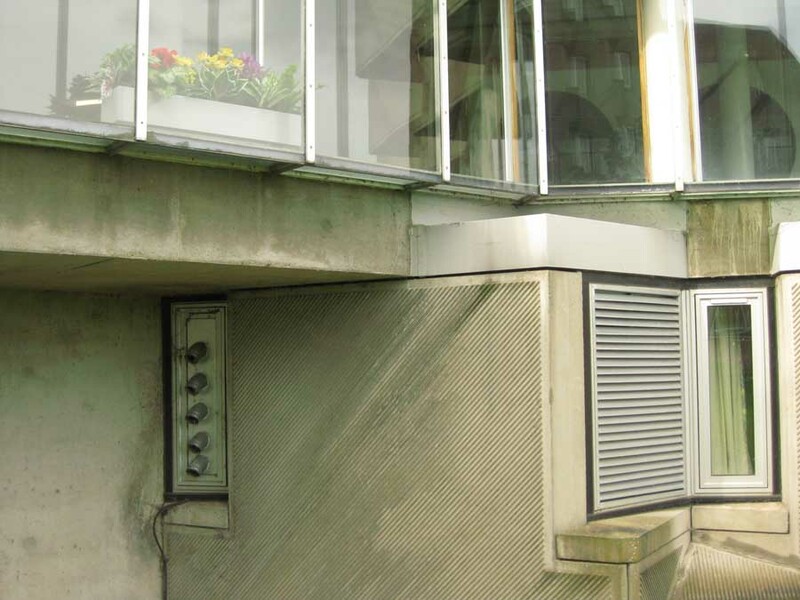 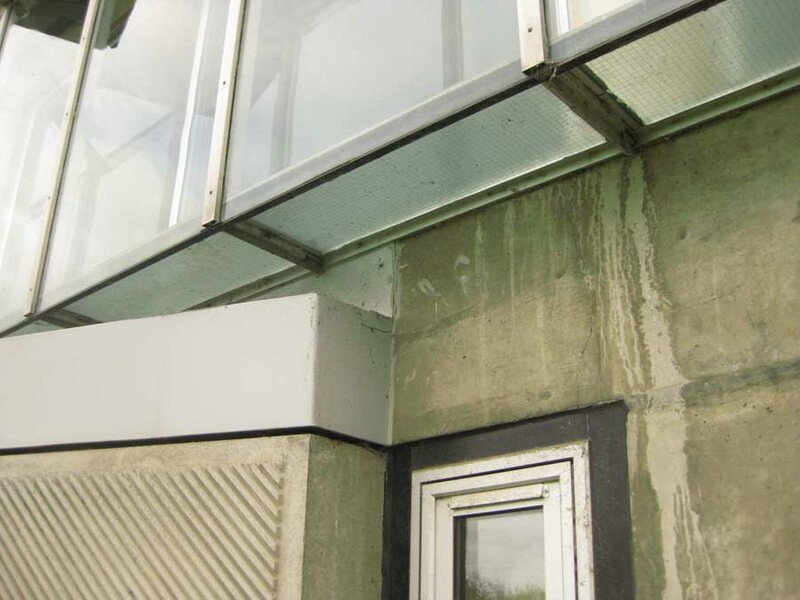 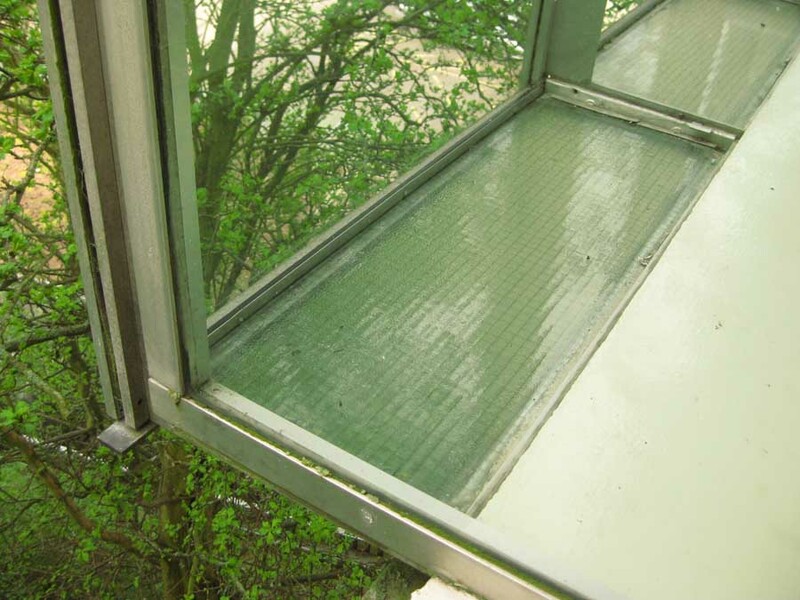 Ribbed concrete panels – with the pattern set at 45 degrees – are tessellated in an intriguing way and broken at roughly mid-height on the elevation by a strip of glazing. 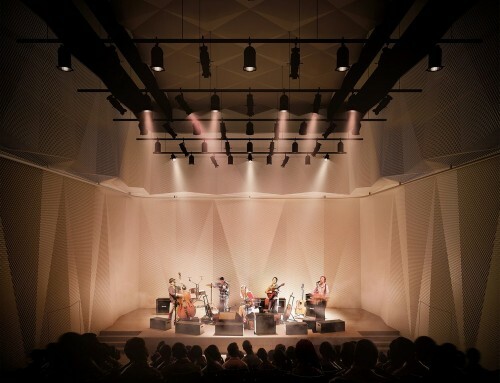 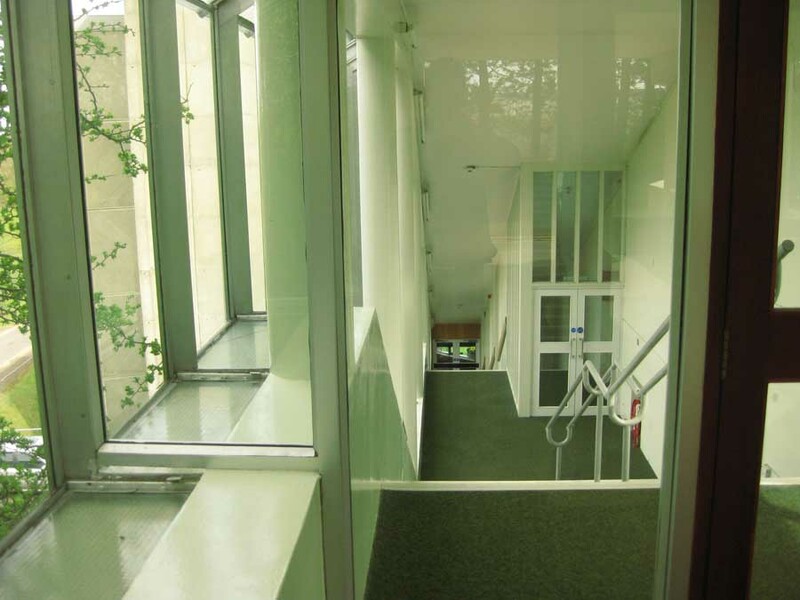 This glazing lines and lights the single-loaded corridors that fan out from the entry. 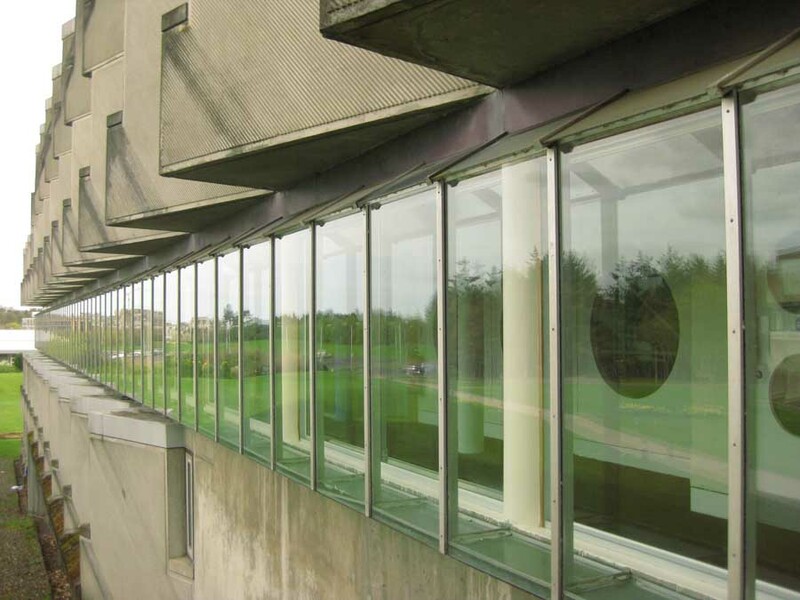 In the wall set behind the corridor are small and large circular windows echoing the Runcorn project by James Stirling in England. 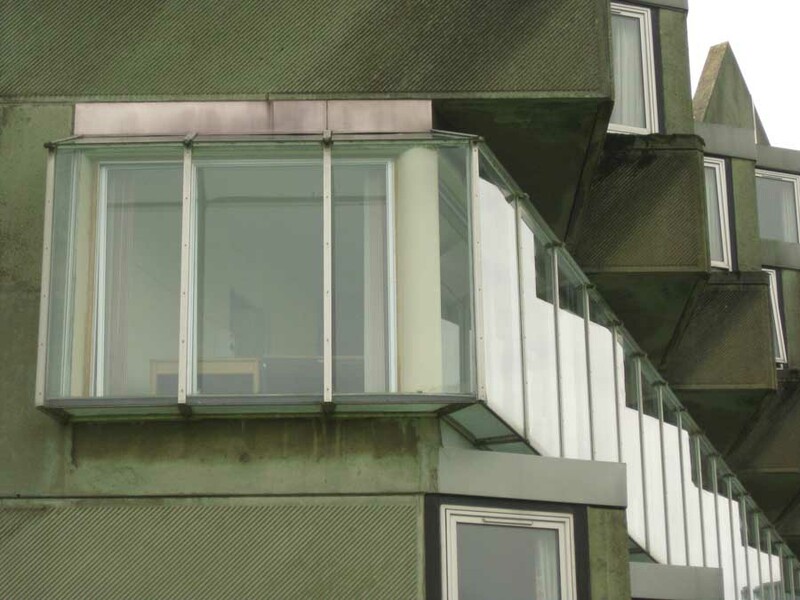 The whole feel of the building is heavily informed by site: it sits with its back against a sharp incline and faces out to the North Sea. 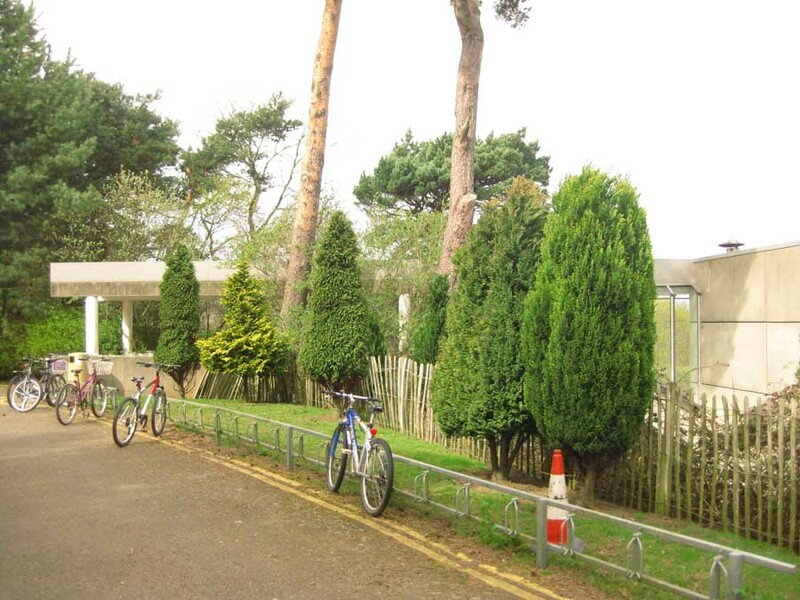 Visiting on a Winter’s later afternoon I found much of this north-facing site was in shade and although the view is superb there is a feeling of coldness, a damp dullness. 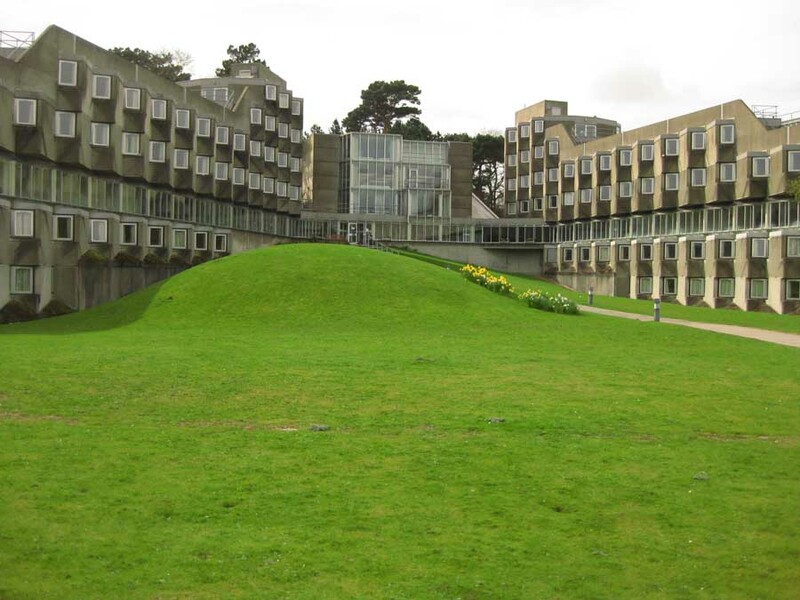 The landscape flows around the building in a fairly simple way, rolling grass over smooth mounds, a bit like the landscape at the Burrell Museum. 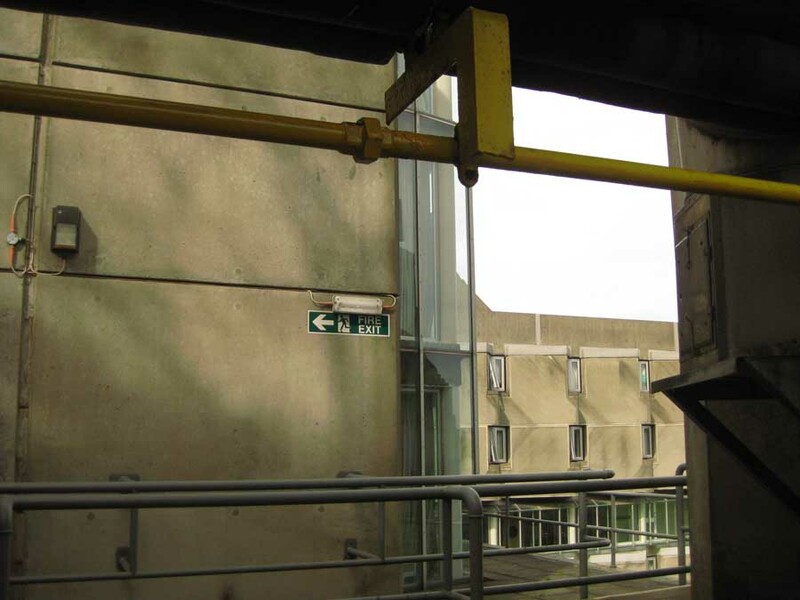 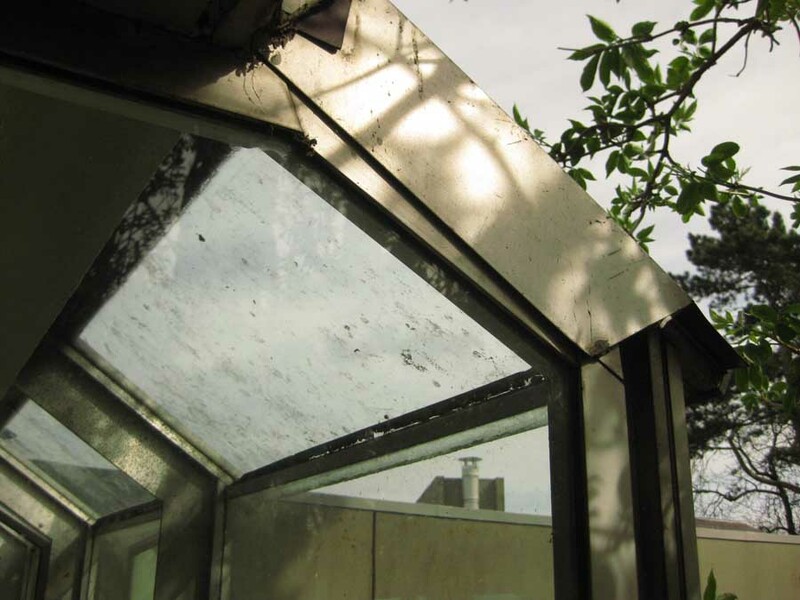 Entry is principally from the northeast, up a path centrally located between the two wings, stepping up the slope to a glazed entry (photo above, left). 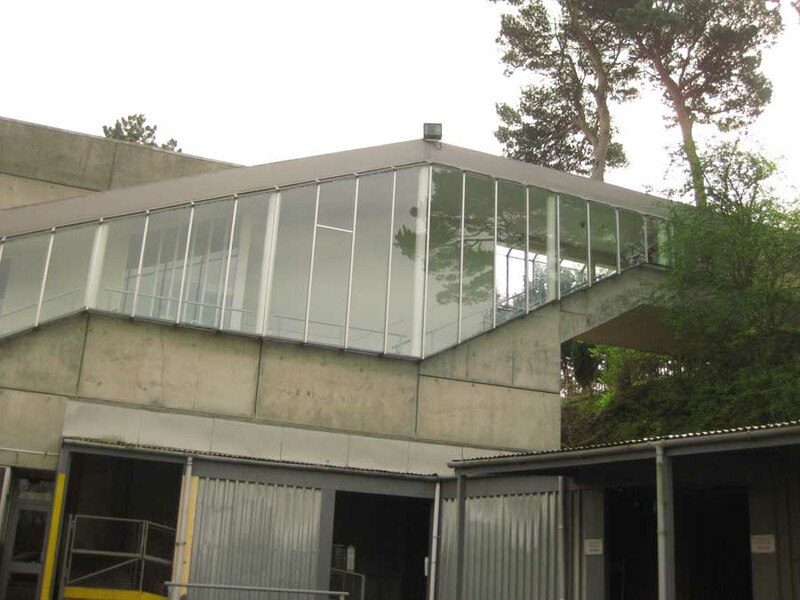 This entry sets the proportions of the elevations as the glazed strips emanate from here. 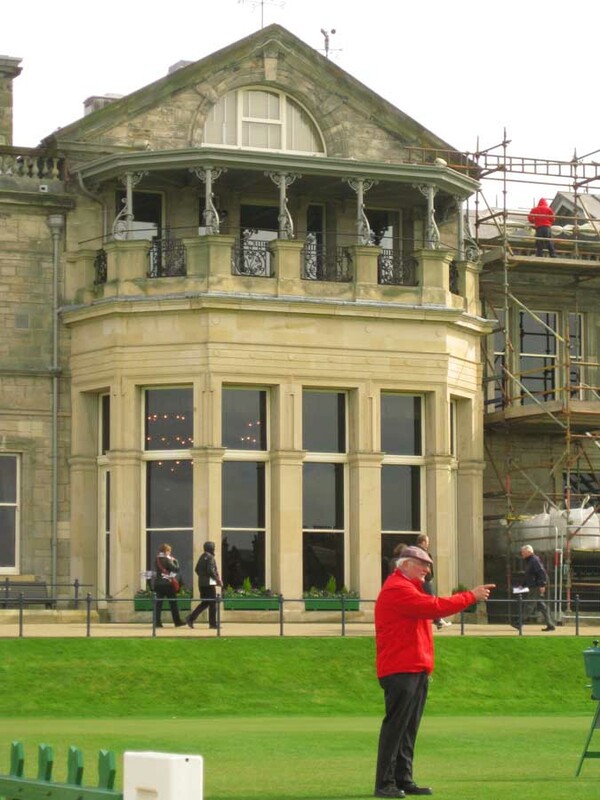 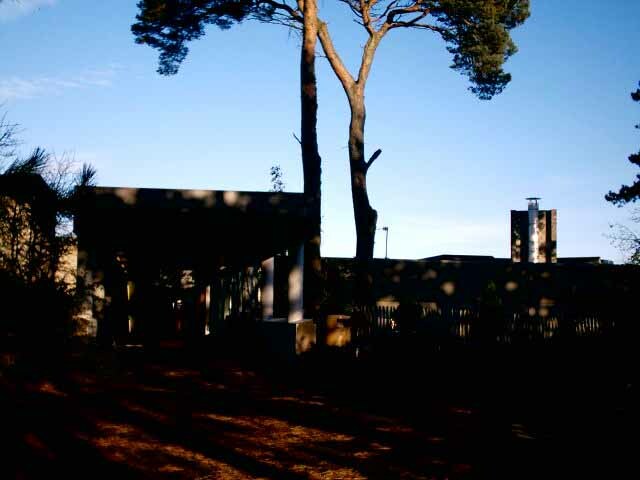 They create a datum with the building’s long wings dropping down and down from this level towards the golf course. 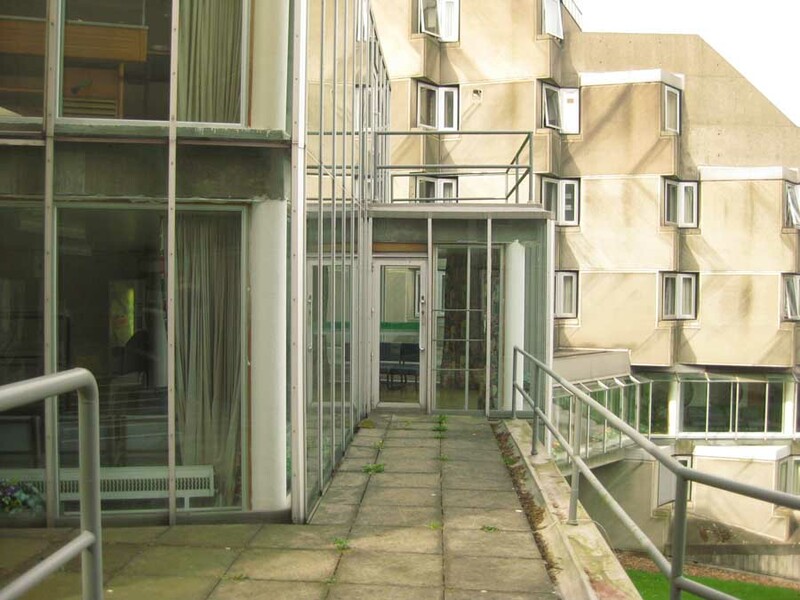 Another entry is located immediately opposite the main one, on the southwest side. 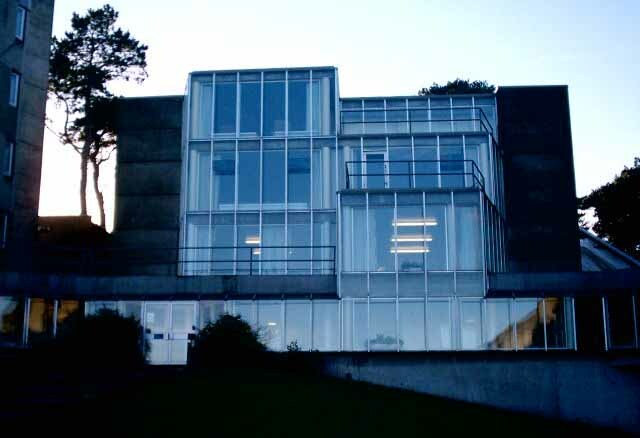 This is high up on a plateau almost on a level with the top roofs. 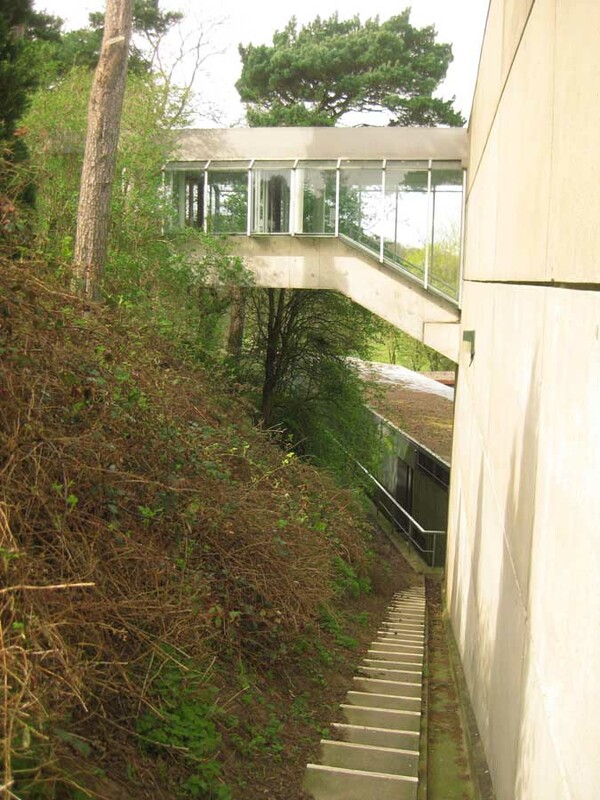 A steep flight of stairs steps down from a simple ‘porch’ but the adjacent Scots Pine trees really make this a place of drama. 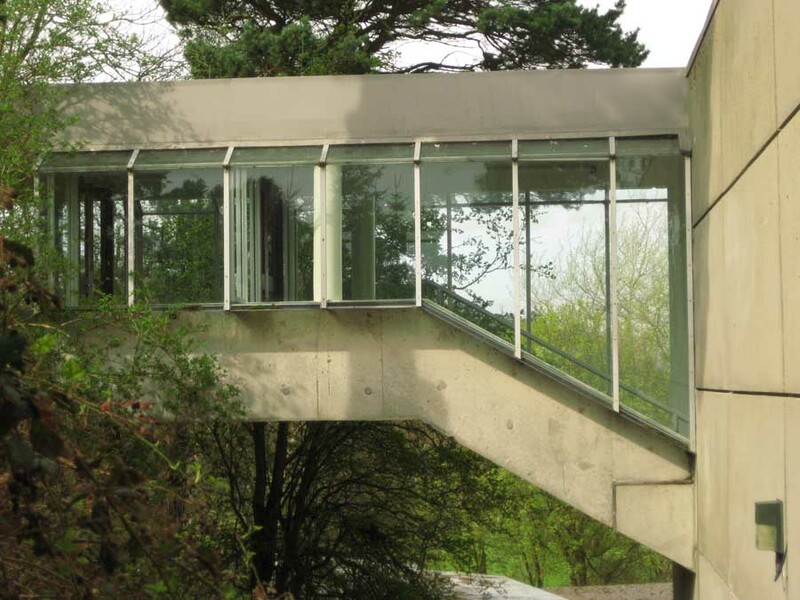 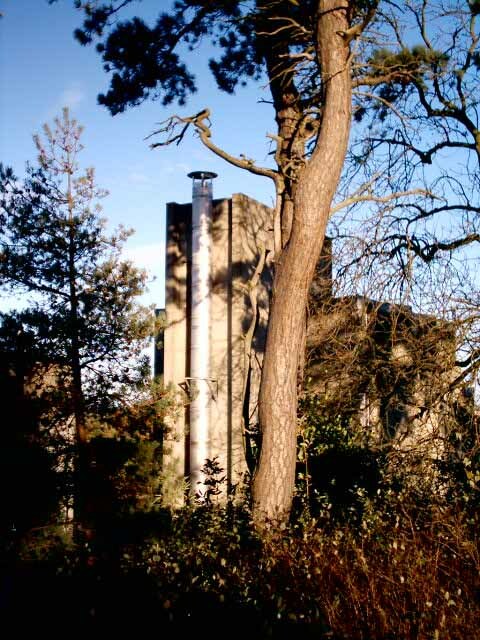 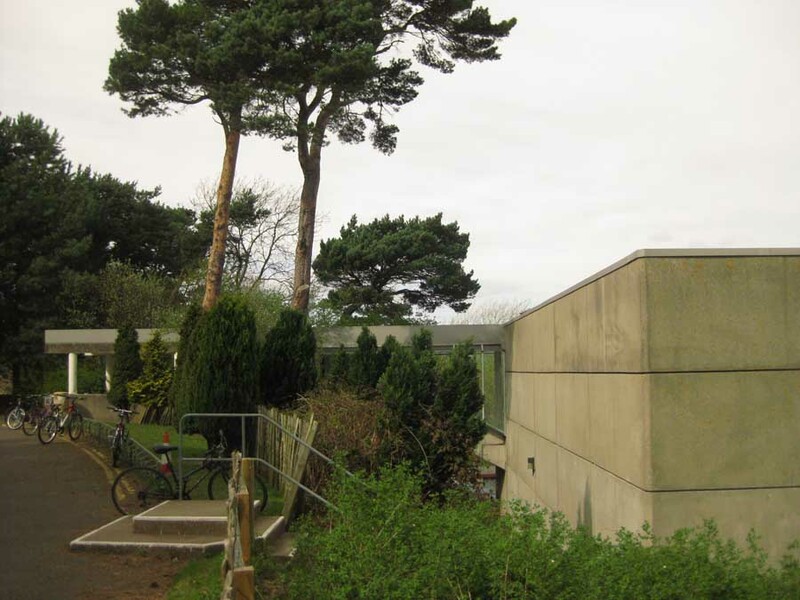 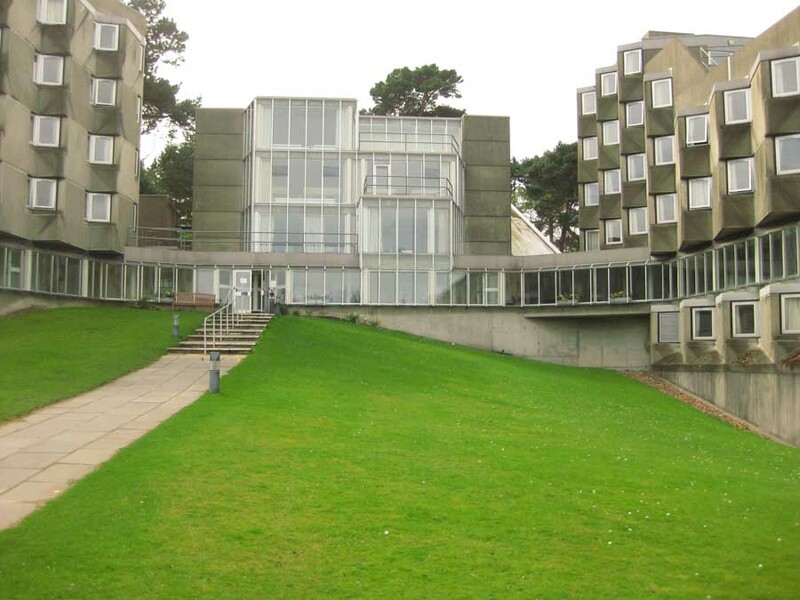 The unrelenting grey concrete panels on this elevation reduce the drama of the pines, incline and sea, surely a trick was missed here by James Stirling. 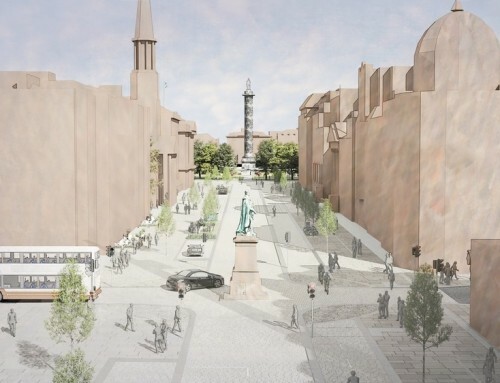 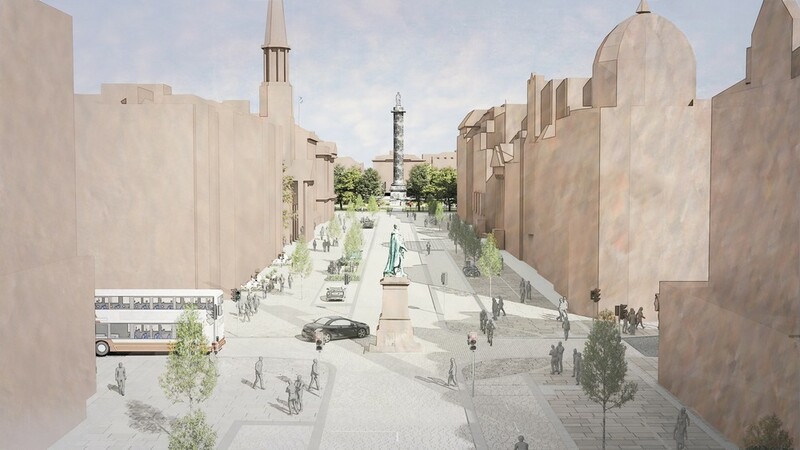 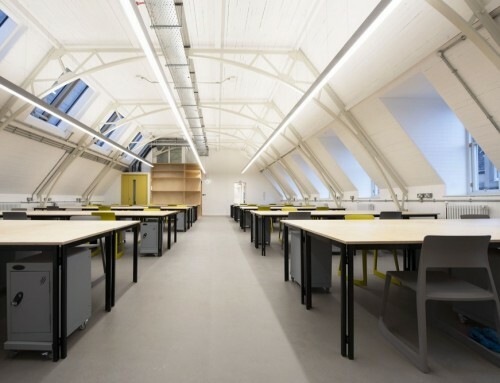 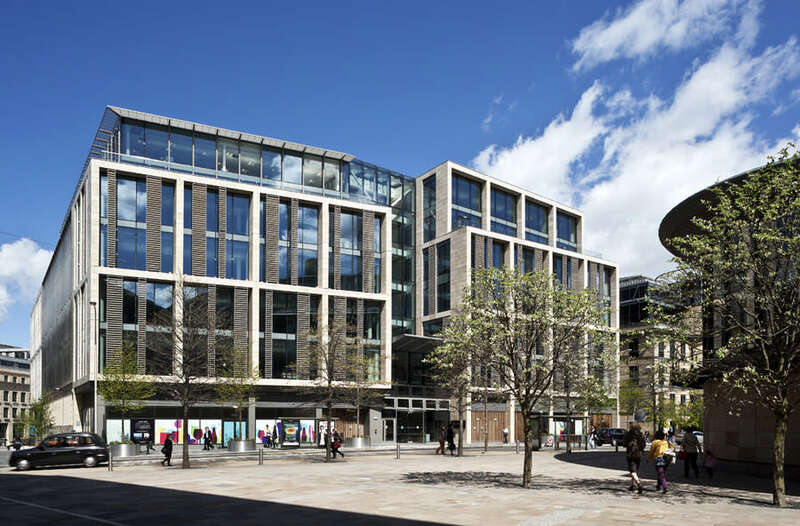 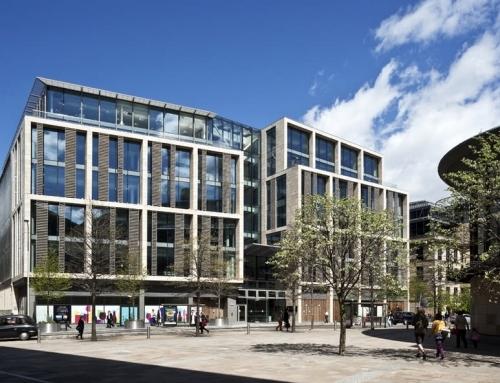 Overall the impression is of a strong building in terms of programme and site relationship but one that has dated. 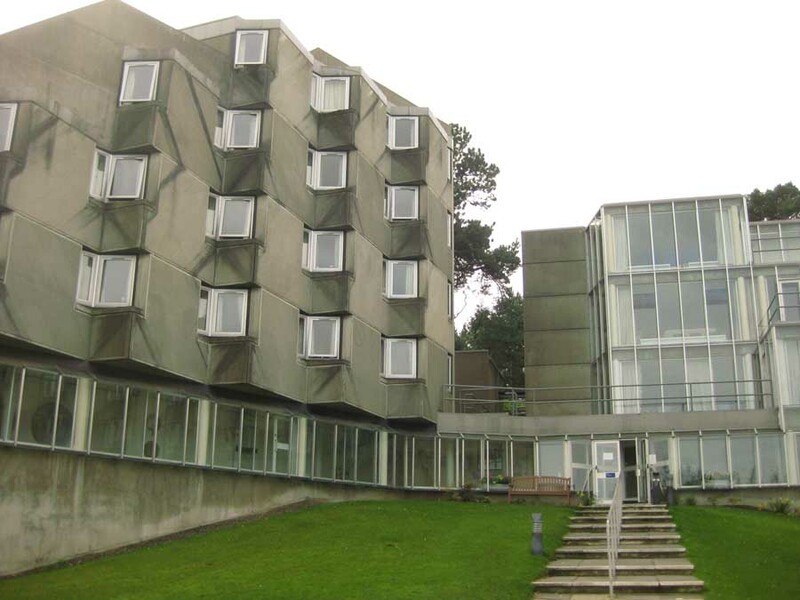 The tessellation and parti are strong but the poor quality of materials and unfriendly facades let it down.